Disclaimer: All figures in this article are estimates only and will be updated as more information becomes available. 9OLQ-6 system, Insmother region. On the 20th of October at 18:00 EVE Standard Time a huge fight erupted over a Supercapital Ship Assembly Array tower in the system between Drone Regions Federations (DRF) and Red Menace Coalition (RMC) forces. The Supercapital Ship Assembly Array tower belonged to RMC forces and was reinforced the day before by the DRF as part of the war waged between the two coalitions. Both parties called for maximum pilot participation and contacted alliances throughout New Eden to join their side as they were gearing up for a major clash. RMC forces and their allies assembled nearly 400 pilots divided between a RMC Machariel Battleship fleet with 6 Triage Archon Carrier support, a Stain-Wagon Coalition (SW) Cerberus Heavy Assault Cruiser fleet and The Initiative. [INIT] Ishtar Heavy Assault Cruiser fleet. The RMC force was the first to reach the system, managing to secure the tower and setting up on the only possible entrance point for the DRF forces in the system – The 3AE-CP gate. DRF forces and their numerous allies gathered on the 9OLQ-6 gate in the 3AE-CP system. All told the DRF managed to muster 590 pilots in 4 fleets including a Triumvirate. [TRI] Machariel fleet, a SOLAR FLEET [SOLAR]\Legion of xXDEATHXx [X.I.X] Proteus Strategic Cruiser fleet, a Pandemic Legion [-10.0] Proteus fleet and a Northern Coalition. [NC] Proteus fleet. Though the tower had been saved by RMC forces and they were clearly prepared for the DRF fleets, a decision was made to jump in and fight anyway. 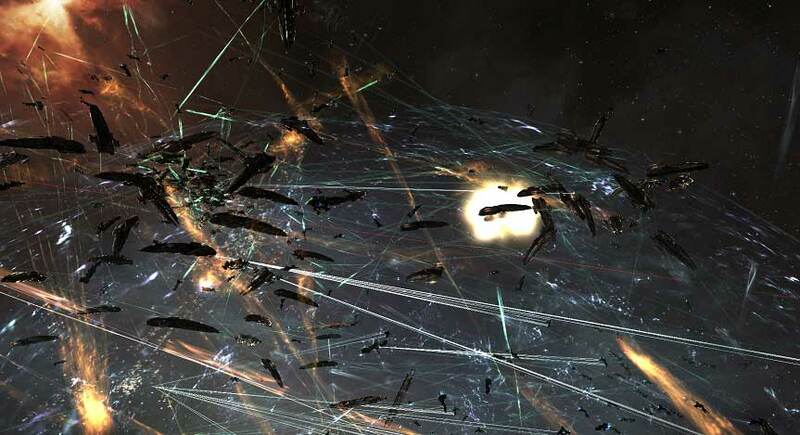 Thus one of the biggest sub-Capital fights in New Eden history began. At first things went very badly for DRF forces and their allies. RMC had anchored mobile warp disruptors on the in-gate, thus preventing the allied fleets from warping off and re-positioning easily. As DRF ships uncloaked and started to anchor and burn away from the gate they were greeted by monstrous volleys from the RMC Machariels and overwhelming missile barrages from the SW Cerberus. One after another support and mainline ships simply exploded under the insane amount of damage pumped at them. However as time went on, the DRF fleet anchored up and burnt straight towards the RMC Machariels, while the DRF Machariels made way out of the bubbles and perched at a distance from the RMC Machariels. Both Pandemic Legion and Northern Coalition fleets chose to perch away from the gate after clearing the myriad bubbles and Interdictors which attempted to hold them down. Once they warped off to their scouts which positioned themselves around the gate area, they quickly aligned towards the RMC Machariels. First landed the Interdictors who hastily deployed bubbles to trap the RMC fleet before the rest of the two fleets could land on top of the Machariels. 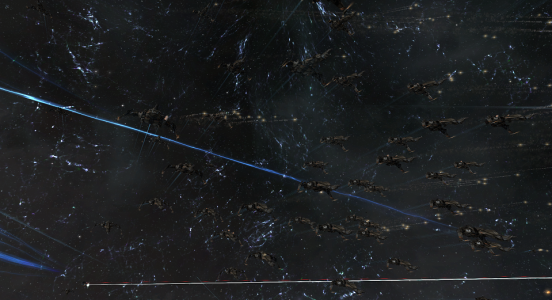 At the same time the DRF Proteus fleet finally managed to reach the Machariels. With the three fleets on top of the Machariels and the DRF Machariel fleet sniping from a distance of 130 kilometers, the entire force of the DRF came to bear on the RMC fleet. However, with peak Time Dilation and 6 Triage Carriers on the field, the DRF side found it extremely hard to break any of the Machariels. Worse yet, the SW Cerberus fleet kitted 70 kilometers away and simply volleyed support and mainline ships with its missile barrages. The RMC Machariels themselves proved to be no less deadly at close range, with many DRF Proteus being shred by their artillery cannons. Worst yet, The Initiative. Ishtar fleet landed close to the Logistics wings of both Northern Coalition and Pandemic Legion and began harassing them. Under this amount of pressure, losses mounted on the DRF side. Yet, the DRF and its allies pressed on. The brutal point blank slaughter continued as Proteus and support ships on the DRF side simply evaporated while RMC Machariels and The Initiative. Ishtars were very slowly broken, the DRF managing to slowly coordinate and concentrate fire on primaries. At this point the DRF forces had been losing 2-3 mainline ships for each RMC mainline ship they managed to kill. As the battle wore on more opportunistic entities started making their presence felt. Stealth Bomber activity was felt by all sides as Paisti Syndicate [PSY] and Phoebe Freeport Republic [PFR] landed wave after wave of bombs on all the combatants. Another third party was Out of Sight. [OOS] which brought its signature Augoror Navy Issue fleet, estimated at 50 pilots. This force quickly landed on top of the DRF Machariels, which only added to the confusion already present on the field. After nearly 90 minutes of a straight out brawl, the 3 Proteus fleets started focusing their fire on the RMC Triage Carriers. Switching back and forth between the Carriers, they attempted to overwhelm them with their dwindling number of Strategic Cruisers present on the field. To the credit of the RMC Triage team, they managed to tank quite well the incoming damage, but with the DRF Machariels back in action and adding its fire power as well, having fended off the Out of Sight. fleet, it was only a matter of time. 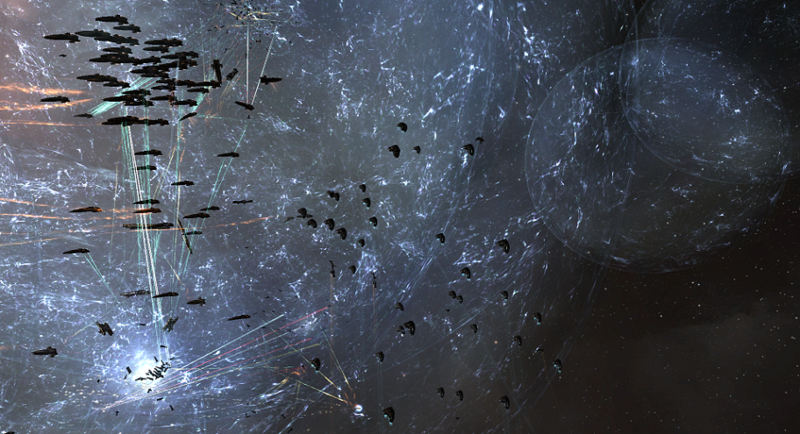 One by one, the Triage Carriers succumbed to the combined fire of 4 fleets. Once enough Triage Carriers were cleared off the field, the focus of the fleets changed from the Carriers to the RMC Machariels. The Proteus utilized their warp scramblers and started tackling as many Machariels as they could in order to shut down their warp drives and prevent them from using MicroJumpDrives. A large portion of the RMC Machariels had become trapped, and with only a couple Triage Carriers remaining on the field, could do little to soak the incoming damage. In rapid succession Machariels were obliterated as they attempted to flee, RMC forces realizing their fleet had been broken. With the majority of the RMC Machariels destroyed, the allied fleets turned their attention to the supporting SW and The Initiative. fleets. skirmishing began in earnest as the 6 remaining fleets maneuvered on grid. After a bruising battle between Pandemic Legion and The Initiative. Ishtars, both SW and The Initiative. fleets decided to withdraw, leaving the grid for the DRF and its allies to claim. Once all the hostile fleets had left, DRF forces and its allies quickly dispatched of the remaining RMC Triage Carriers which were stranded on the field. 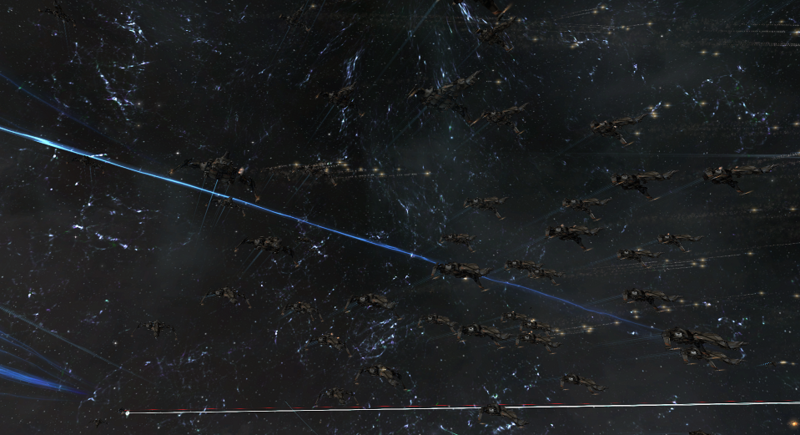 With no more targets left, DRF forces and allied fleets safely extracted from the system. Battle report for the 9OLQ-6 system can be found here. All told the battle lasted 3 hours and saw more than 1070 pilots fighting in the height of the engagement. Time Dilation was present and a constant factor in the fighting, reaching and staying at 10% throughout much of the fight. The DRF and its allies lost no less than 83 Strategic Cruisers and 6 Battleships. Along with other support ships DRF and allied forces lost 168 ships for a total of 71.02 Bil ISK. RMC and its allies lost 6 Carriers, 88 Battleships and 23 Heavy Assault Cruisers. Including support ships, RMC and allies lost 158 ships for a total of 84.62 Bil ISK damage. Tags 9OLQ-6 battle report Drone Regions Federation Insmother Northern Coalition Out of Sight. Paisti Syndicate Pandemic Legion Phoebe Freeport Republic Red Menace Coalition Stain Wagon Coalition The Initiative. Howdy! Quick question that’s completely off topic. Do you know how to make your site mobile friendly? My website looks weird when viewing from my apple iphone. I’m trying to find a theme or plugin that might be able to resolve this problem. If you have any suggestions, please share. Thanks! Thank you for the good writeup. It in reality used to be a amusement account it. Look complex to far added agreeable from you! However, how could we be in contact? Excellent web site. Lots of helpful info here. I am sending it to a few pals ans also sharing in delicious. And certainly, thank you for your effort! What are one of the most popular blog websites in the Philippines where I can send my blog sites for others to read? I am just commenting to make you understand what a useful encounter my wife’s daughter went through using your web site. She noticed lots of things, most notably what it’s like to have an ideal helping heart to get certain people clearly know just exactly specific complicated subject matter. You truly surpassed my expected results. Thanks for supplying those necessary, trusted, edifying and also cool tips on that topic to Jane. you’re really a just right webmaster. The website loading speed is amazing. It seems that you are doing any unique trick. Furthermore, The contents are masterpiece. you have done a magnificent task in this topic! Hello, i think that i saw you visited my weblog so i came to “go back the prefer”.I’m attempting to find things to enhance my web site!I assume its ok to use a few of your ideas! !